See our discovery-based curriculum in action. Long Live Summer! Our students, teachers, directors, and parents have been living up our favorite season to it’s fullest potential. From ladybug studies to splash days, and plant exploration to ice cream stands and socials - we have been on the go since the beginning of the season. It has been amazing to watch our little ones embrace all their new lessons as we utilize the outdoors as our second classroom. Nature has allowed us to expand our curriculum! The students have been challenging their minds and bodies in a new environment, with hands on nature lessons and the implementation of our, ‘Stretch and Grow’ curriculum with Coach Michelle. Everyone is exploring with inquisitive minds and moving their bodies with renewed enthusiasm in the fresh air! Just like the scenery around us the kids are blossoming and quickly growing. 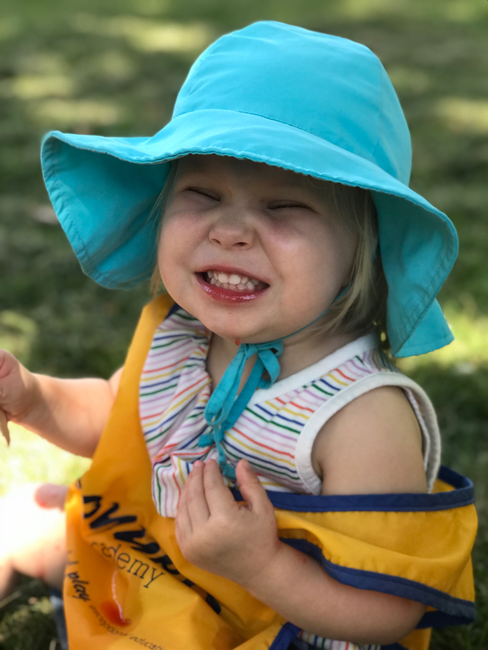 Our infants are crawling, toddlers are mastering new milestones, the terrific twos are learning all the life skills of becoming preschoolers, and preschoolers are asking more and more questions each day. Last but not least, and much to our wishes to stop time our pre-k students are preparing for their next chapter - Kindergarten. We know Fall is nearing, but for now, on this day, in this moment…we are enjoying Summer Adventures with all our amazing kiddos! Our West Loop PreK Students...So Cute! Our West Loop PreK Students...So Silly! Theme: Summer Adventures Long Live Summer! Our infants are busy this month! We have been working on movement, singing nursery rhymes and taking music into our own hands as we explore different instruments and even making our own! A major focus has been on fine motor skills. As part of mastering fine motor skills, teachers have been working on pincer grasps and hand-eye coordination. In one lesson, children were given 4” high pool noodles, q-tips and wands/straws. The teacher’s demonstrated passing the q-tip through the pool noodle, and then they tried a wand/straw through the pool noodle. The children watched their teacher and then imitated the behavior. The children did great!!! Xylophone music - "My Rhino Plays the Xylophone"
Cultural drum music - "I Want to Be a Drummer"
Classical piano music - "If You Ever Want to Bring a Piano to the Beach, Don't!" Instrumental guitar music - "Sing to Me"
Peaceful music with bells - "I Got the Rhythm"
After all that reading, we needed to get up and move! We turned up the tunes and incorporated our shakers as we danced! When we took a break from moving our feet, the teachers showed the children another added bonus of the silver belles in our shakers. By using a magnet on the outside of the shaker, we were able to move the contents of the shaker without moving the bottle/shaker at all! This was a great way to incorporate some fine motor skill movement. Build your own shakers from items at home. Rinse and dry a plastic bottle (great way to recycle plastic too), allow your child to add furry craft balls or fabric of different sizes and colors and silver belles. Fill from 1/3 to 1/2 of the bottle, place the cap back on the bottle and you have your very own colorful shaker! It sure is summer in our Toddler room! The children are exploring insects, ants, bees, ladybugs and butterflies this month. They began each day of the week reviewing a bug or insect. One week was all about the teeniest, tiniest insects of all…ants! During circle time the teachers introduced the word, “ant”, and focused on the letter “a”. During circle time, the children and teachers discussed where you see ants and what they look like. Together, they discussed the color, size and movements of ants. We decided you mostly see ants on a picnic. This discovery led to lots of fun exploratory art projects. Some included the children painting paper plates the color pink with little black dots, then the teachers cut them into 1/4 pieces, resembling watermelon slices. The children also colored sheets of paper with black dots - we placed them on the ground and had a pretend picnic. This unit touched on a lot of great learning objectives - color recognition; identifying and recognizing objects by their name, shapes and gross and fine motor skills. Take your lunch on the go this weekend. Let your toddler help you pack food for a picnic. Allow them to help you wrap sandwiches, fold a blanket and pack some cool drinks. A good stroll and change of scenery at mealtime can help your little one work up an appetite. While you are out and about, see what insects and bugs you see. Talk about colors and how many you see. Here is some great inspiration before your picnic. Each week this month the children focused on a different outdoor adventure. The adventures included: Beach Life, A View at the Zoo, Welcome to the Carnival and Outdoor Sports. During A View at the Zoo week this month, the children used the dramatic play area as an opportunity to create their own zoo; there were many different animals for the children to play with. Teachers helped create a puppet theater stand along with animal puppets so students could enjoy mimicking the sound of animals while conversing with one another. The library was filled with plenty of animal books for friends to see, read and touch - many having fuzzy textures of the animals. One of their favorites stories was, Dr. Seuss, ‘Put me in the Zoo’. A true classic about a leopard named, Spot. Spot shows two young friends all the exciting things he can do with his spots. From changing their color and juggling them, to moving them onto everything around him, the children loved reading about Spot. During exploratory art, the children created their own leopard. They used crayons to color a paper plate completely yellow. With help from their teachers they glued on different colorful and circular patches on the plate. The children retold the story and acted out new adventures that Spot could do! Our Lincoln Park students are fortunate to visit the Lincoln Park Zoo regularly. Lincoln Park Zoo is compact and walkable for our little friends. A visit can last one or two hours or pack a lunch and stay for the day. Other wonderful day adventures include the Morton Arboretum or the Chicago Botanical Gardens - pick a day and set out on a summer adventure! Lemonade…Lemonade…Twenty-Five Cents!!! Our Hyde Park preschoolers had so much fun creating their own Lemonade Stand. It was a great activity for the children to learn how to brainstorm an idea and execute it. The children worked with their teachers to make a list of items they would need for their stand. They then discussed who would attend their stand - our parents of course! The children worked on invitations and our director and teachers helped with a lemonade stand cutout for the big day. In preparation for their lemonade stand, the preschoolers used their fine motor skills and their math skills to learn about money. They learned what a penny, dime, nickel and a quarter look like - we discussed the size and color, and what the coins are worth. We came up with a cost for each cup of lemonade - $0.25. Working together the children made pitchers of lemonade, setup tables and their lemonade stand. They took turns greeting guests and parents and providing their product as they collected funds for their lemonade. We were so proud of how all the children collaborated to prepare for their business and how they worked together as a team to make this idea a success! Dramatic play is such a wonderful way to connect with preschoolers and guide their imagination. Ask your child to brainstorm what type of business you could visit together - the grocery store, the dry cleaner, the veterinarian, the dentist or the coffee shop. Decide on a business to create together. It’s amazing what a large empty amazon box can be turned into with a bit of imagination. Check out all these fun Dramatic Play ideas on Pinterest. Our Pre-K class was very excited about this month’s theme, Summer Adventures. 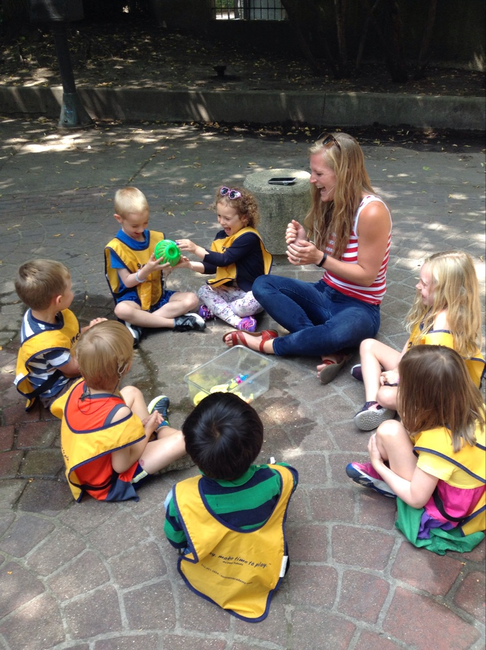 Each week the class participated in activities centered on a specific summer adventure. One week was dedicated to boating. The class listened to many summer adventure stories, but particularly enjoyed the story, "Pond Circle" by Betsy Franco. The students participated in a sequencing activity using various materials and animals from our classroom environment. Each friend received either an item to build the setting of the story or a character (an insect or animal). Our friends were asked to listen carefully for their part in the story to be read aloud and then rebuild the setting and story line using the concrete objects provided to them. This literacy lesson focused on reading comprehension - something they already know will be apart of their schooling this Fall. Don’t forget about games! Whether it is family game night or a Saturday afternoon pick up game. Our Pre-K students recently enjoyed playing a game called, Splash Out! Our teacher filled up water balloons and placed one inside of our splash out ball to begin each round. When the timer on the ball started, the children passed the ball quickly and carefully around the circle. When the timer was up, the balloon popped and whoever was holding the splash out ball got wet! It was definitely a summer favorite and we look forward to playing it again! Check it out! ‘We ‘Gotta Wiggle’! Our fast-growing infants are moving and shaking! 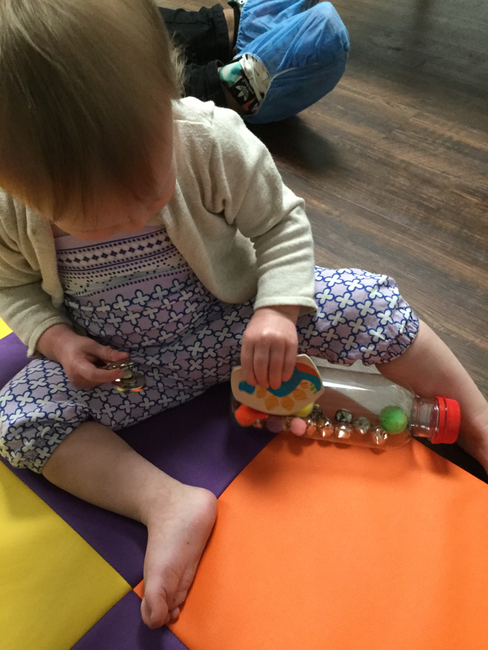 To help them strengthen awareness of isolated body parts and movement, we are encouraging them to move as we sing about, toes, knees, tummy and legs! We are working on story-telling through music this month. Our students will gather in a circle and sing, ‘Hop Old Squirrel’ as they move like a furry little squirrel. This lesson helps the students act out and dramatize the song while we use our bodies. Once we master our squirrel moves, we add instruments and put all the pieces together! FREEZE! We will be playing freeze dance as we sing to, ‘Skip To My Lou’. When the music stops and we say FREEZE - students that move will have to sit down. This is a wonderful lesson to fine tune our emerging listening skills and sharpen our reasoning and social skills. All the while the children are moving their bodies and having fun! The students have been reading and singing along to the bilingual book, ‘Little Chickies/Los Pollitos’ by Susie Jaramillo. This pictorial book features our song of the month, “Los Pollitos”. Señor Hamlet has incorporated puppets of farm animals to introduce each animal in Spanish to the children. They then sang the lyrics from, ‘Los Pollitos’. What’s in the farm? / Qué hay en esto ¿granja? Señor Hamlet presented farm animal toys to the group, he introduced each animal in Spanish. Together they sang, “Old McDonald had a farm” / “El viejo Macdonald tenia una granja” and held up the animal as they sang! Games are a perfect way to engage this age group. Señor Hamlet worked with the students on identifying different musical rhythms while learning vocabulary. Through the game, London Bridges Falling Down, the children gathered while two friends held their hands up high like a bridge, we began to sing our featured song, when the song ended, they brought their arms down - trapping a friend inside. They had a great time playing this ronda / game. Check out what's happening inside the classroom.